If you knew something was bad for your health, would you change your habits or behavior? Perhaps this is something that you eat/drink or it’s a behavior, like smoking. But what if this something bad was where you lived? More than ever, we are becoming aware that the environment can harm us – especially if it is unmonitored. A March 31, 2017 MSNBC piece, “Inside a ‘Super Polluter power plant,” focused on a small county in SW Indiana that is suffering from the devastating effects of the nearby power plants. 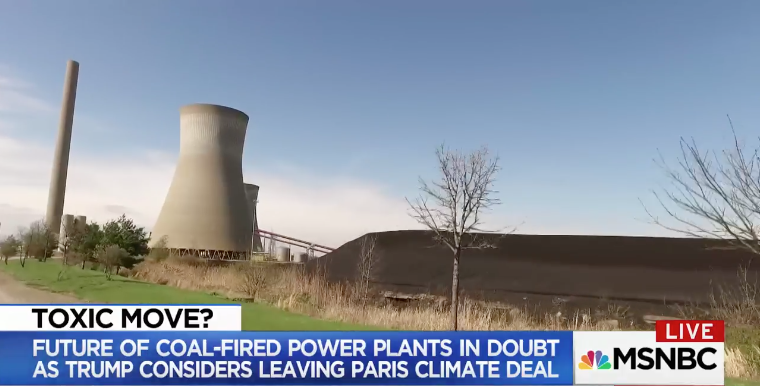 MSNBC journalist Jacob Soboroff’s reporting of the Rockport Generating Station is a disturbing look at big polluters and their big consequences. While two men from the plant mention they are working to reduce emissions, Soboroff has to prompt them about the consideration of the public’s health in the area. Their reply? “Public health is a concern of ours” as they go on to list how they are abiding by all regulations. Yet the journalist sees a different side of the public health story when he waits outside a clinic and interviews a couple with a young child. Their 2-year-old had been to this same clinic for the same asthmatic issues over 50 times. Again, he’s only two. When interviewing the pediatrician, Dr. Norma Kreilein, she is visibly upset by the lack of regulations and the simultaneous ill-health of the surrounding community. Especially the children. At one point in the video, she begins to cry as she speaks about the lack of monitoring at the power plants. “They don’t have to take care of these kids,” she says. Unfortunately, this gap is a problem that is all too common. The first step? Monitoring. With proper reports from sites like the Rockport Generating Station, communities can be informed about what is in their air, water and soil and they can make the best decisions for the children. With accurate data, real change can begin. The Report shows an extremely high industrial pollution number, air pollution in the 84th percentile, 6 Superfund sites with 26 schools within 10 miles, and asthma in the 79th percentile. The Report shows that air pollution risk is in the 84th percentile, there are 6 superfund sites nearby, 19 schools within 10 miles, in the 89th percentile for lead risk, and, perhaps most harrowing, 10 out of 1,000 children die before their first birthday (far above the average rate for infant mortality in this country).